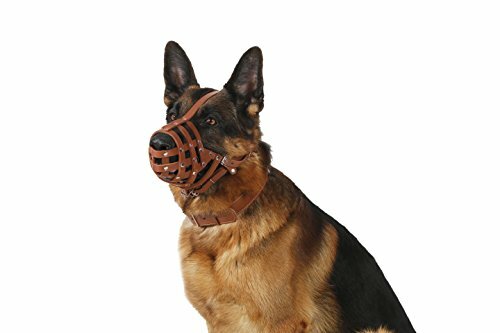 Handmade leather dog muzzles for German Shepherds. May also fit Dalmatians, Dobermans, Setters and other breeds with similar snout. Muzzle made out of genuine leather. 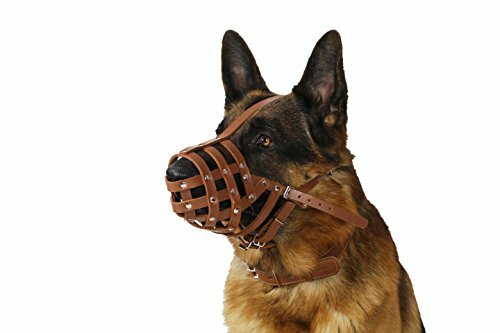 This is a secure comfortable training dog muzzle with 2 adjustable straps. This muzzle gives your dog plenty of air due to a great ventilation. Muzzle comes in 2 sizes and 2 colors black and brown. Size M A - 11" (28 cm). B - 3 1/2" (9 cm). Size L A - 12 3/5" (32 cm). B - 4 1/3" (11 cm). Where A is circumference and B is length of dog snout. Circumference - measure approximately (small dogs & short snout dogs 1/2" below their eyes) (big dogs 1" below their eyes) go all the way around the snout. Length - measure your dog from the inside corner of one eye to the tip of its nose. If you have any questions please do not hesitate to contact us. Please visit our shop for more pet products. Polished hardware, genuine leather. We also offer wholesale prices for our customers. If you are interested in buying our items for resale please contact us for details. A handmade Dog Muzzle. Intended for German Shepherd, Dalmatian, Doberman, Setter and other breeds with similar snout. Has adjustable straps. Made out of genuine leather. Please measure circumference and length of your dog's snout. A - is circumference of dog's snout. B - length of dog's snout. Size M A is 11". B is 4". Size L A is 13". B is 4". If you have any questions please do not hesitate to contact us.